ABC is lending some help to some of its newer shows. 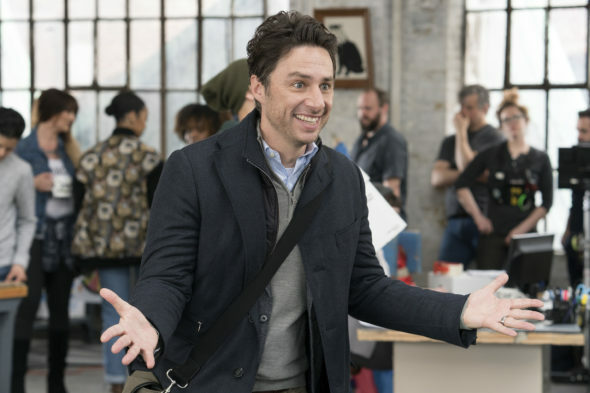 This week, the network announced special airings for both Deception and Alex, Inc.
A comedy, Alex, Inc. stars Zach Braff as Alex Schuman, a successful radio journalist who quits his job to start his own podcast company. The cast also includes Tiya Sircar, Hillary Anne Matthews, Michael Imperioli, Audyssie James, and Elisha Henig. Meanwhile, Deception centers on Cameron Black, an illusionist who uses his tradecraft to help the Feds apprehend some of the most elusive criminals in the world. Jack Cutmore-Scott, Ilfenesh Hadera, Lenora Crichlow, Amaury Nolasco, Justin Chon, Laila Robins, and Vinnie Jones also star. Ratings have been low for both freshman series, with Deception currently averaging a .85 in the 18-49 demo and Alex, Inc. averaging a 1.01 rating in the 18-49 demo. To help, ABC is airing episodes of both series on special dates. An episode of Alex, Inc. will follow Roseanne on April 17th at 8:30 p.m. ET/PT and an episode of Deception will air on April 24th at 10 p.m. ET/PT. “The Nanny” – Alex thinks he fired their part-time babysitter, Rosalba, after he and Rooni find her sleeping on the job, but the situation gets more complicated when Rosalba shows up for work. Meanwhile, Ben takes over as babysitter and watches Soraya after school; and Rooni loses cell service and gets nervous about the kids being left home alone, on “Alex, Inc.,” TUESDAY, APRIL 17 (8:30-9:00 p.m. EDT), on The ABC Television Network, streaming and on demand. Guest starring in this episode is Laura Patalano as Rosalba. “The Nanny” was written by Juliet Seniff and directed by Alisa Statman. “Alex, Inc.” is broadcast in 720 Progressive (720P), ABC’s selected HDTV format, with 5.1-channel surround sound. This program carries a TV-PG, DL parental guideline. “Sacrifice 99 to Fool One” – When the Mystery Woman kidnaps Cameron, the FBI calls on Jonathan Black to help find him – and stop the Mystery Woman from committing her next crime, on ABC’s “Deception,” airing TUESDAY, APRIL 24 (10:00-11:00 p.m. EDT), on The ABC Television Network, streaming and on demand. “Sacrifice 99 to Fool One” was written by John A. Norris and directed by Rob Hardy. “Deception” is from Berlanti Productions and Quinn’s House in association with Warner Bros. Televsion. Chris Fedak is creator and executive producer. In addition to Fedak, the series is executive produced by Greg Berlanti, Martin Gero and Sarah Schechter. Illusionist David Kwong (“Now You See Me”) is co-producer. “Deception” is broadcast in 720 Progressive (720P), ABC’s selected HDTV format, with 5.1-channel surround sound. A TV parental guideline will be assigned to this program at a later date. What do you think? Have you seen either Alex, Inc. or Deception? If not, will you watch the special airings? More about: ABC TV shows: canceled or renewed?, Alex Inc., Alex Inc.: canceled or renewed?, Deception (2013), Deception (2013): canceled or renewed? I did watch Deception, liked it so far. I am really enjoying Deception…Love the casting choices. Please give it a chance to establish an audience. Deception is a good show. Reminds me of “The Magician” with Bill Bixby back in the 70s. Hope it gets at least a 2nd season. AGREE 100% with DELI comments (below)! Very enjoyable, entertaining show – give it a chance! We really enjoy Deception! Hope they don’t cancel it. Give it more episodes and a season 2!! It’s original and clever. Please don’t cancel Deception! It’s such a good show. I just think it wasn’t advertised enough. Its a lot like Castle. Give it a chance to catch on. Deception is original and well done. The chemistry between the main characters is perfect. My husband and I look forward to every episode. Please renew. Deception deserves more time, will watch on 24th and all showings in between! Deception is my favorite new show which means it will probably be cancelled. It doesn’t pay to get attached to any show. Deception is the best. It’s one of a kind. Please renew it!